SCVHistory.com LW3432 | Film-Arts | William S. Hart, Louise Glaum Star in 'The Aryan' (1916). 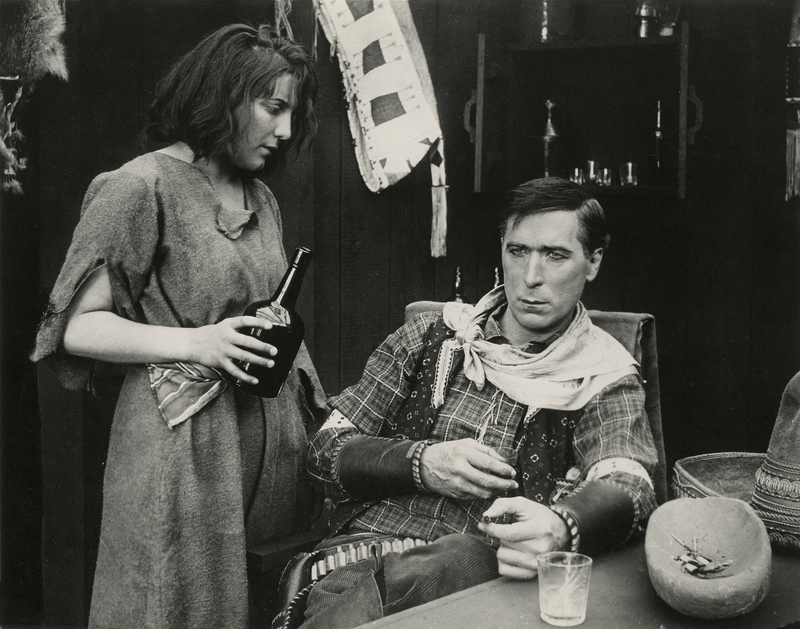 William S. Hart and Louise Glaum are paired in Thomas Ince production of "The Aryan" (Kay-Bee/Triangle 1916), from an original story by C. Gardner Sullivan, who wrote scenarios for numerous Hart films. Early 8x10-inch copy print, possibly 1940s-1950s, from the Museum of Modern Art Film Library in New York. Note the mortar, probably of Southern California origin, on the table. The beaded cradleboard, hanging, is from a plains tribe, probably Sioux. Screenwriter C. Gardner Sullivan creates what may have been Hart's roughest role — a miner named Steve Denton who rides into a town, gets tricked and robbed in a gambling hall, goes berserk on the townsfolk, kidnaps the barmaid (Glaum) who was in on the scheme, and makes her his slave as he turns his back on the "white race" and takes up with a gang of ruffians. Only very late in the picture does a (different and younger) girl soften his bitter heart. "The Aryan" went into production in November 1915. Critics were already beginning to tire of Hart's persistent portrayal of the "Western badman reformed through the sweet and humanizing influence of a pure-minded girl" (although audiences continued to eat it up), and they urged him to explore other motifs. In that respect, "The Aryan" didn't disappoint. Hart's character was, in his own words, "a white man who, forswearing his race, makes outlaw Mexicans his comrades and allows white women to be attacked by them" (Davis (2003:83). As Variety put it (March 24, 1916): "All Hart plays are somewhat similar, and in the majority it is more Hart than story, but in this case the two seem to have been very happily [!] blended by the author [Sullivan], and the result is a very likeable five reel production." Through the years, Hart expressed ambivalent feelings about the picture. In his autobiography he referred to "The Aryan" as "a gripping story" and "one of the best Westerns ever made." Yet later, in his retirement years, he claimed that Steve Denton, his role in "The Aryan," was the most disagreeable part he ever played. "It was hard for me to really feel it," the actor said. "It is difficult to put all one's decent instincts aside and live and think as such a despicable character must have done." [...] Hart said that he had to imagine all the terrible wrongs he had ever experienced to make the character believable. Mexicans repeatedly came off as nefarious in Hart's movies. Recent border skirmishes, the search for Pancho Villa by American troops in Mexico, racist attitudes in California and the Southwest, and the basic Aryanism of screenwriter Gardner Sullivan combined to produce portraits of Mexicans as deceitful, untrustworthy, lustful, and vicious. White villains were sometimes described in Sullivan's titles as having the "oily craftiness of a Mexican," and renegades who sold out Anglo-Saxon interests to Mexicans were viewed as particularly contemptible. Only a fragment of the picture survives in the Library of Congress as part of a subsequent compilation. Produced by the Triangle Film Corporation under the supervision of Thomas H. Ince; distributed by Triangle; in production November 1-December 1, 1915; released April 9, 1916; ©April 13, 1916; production cost, $13,531.67; five reels. Directed by William S. Hart; story and screenplay by C. Gardner Sullivan; photographed by Joe August. CAST: William S. Hart (Steve Denton); Gertrude Claire (Mrs. Denton); Charles K. French ("Ivory" Wells); Louise Glaum (Trixie, "the Firefly"); Herschel Mayall (Chip Em-mett); Ernest Swallow (Mexican Pete); Bessie Love (Mary Jane Garth). SYNOPSIS: Steve Denton rides into Yellow Ridge with a money belt filled after years of toil in the mines beyond the desert. The local gamblers covet the fortune but fail to get Steve to try the roulette table until the enticer, Trixie, comes to exercise her charms on him. He blindly follows her lead and is watching the wheel with stern stare when a telegram is received. He asks the woman to read it. She lies when she says it contains good news, for it tells of the critical illness of his mother. In the morning Steve awakes to find his belt is empty. In his feverish search through his pockets he comes upon the telegram. As the truth dawns he goes to the telegraph office to send a wire home. The operator hands him the news that his mother has died. Wild with rage, he shoots up the town and drives away with Trixie lying limp over his horse before him. His heart is now filled with hate for all women and Trixie becomes his slave in a community where he tolerates only the scum of the section. Across the desert comes a pack train of Mississippi farmers who have left their fertile valleys to hunt for gold. Their water is all but gone and their stock is fagged. Their leaders plead with Steve for aid, but the white race may expect nothing from him. Back to the wailing women and children go the despondent leaders. Mary Jane, a waif among them, is not cowed by the story they tell. She goes at night to repeat their pleas to the harsh white man. He looks upon her as another victim to share Trixie's lot, but her innocent and fearless attitude toward him makes him hesitate. LW3432: 9600 dpi jpeg from copy print purchased 2018 by Leon Worden.